Hello and welcome to another edition of Far East Adventure Travel The Podcast, brought to you by Far East Adventure Travel Magazine, stories, video, images and inspiration for your next adventure in Asia. The latest issue featuring reports from Laos and India. Go to the iTunes Store, search Far East Adventure Travel, download the app and subscribe. In the latest issue of Far East Adventure Travel Magazine the cover story is all about the Gibbon Experience in Northwest Laos. A chance to zip line and live in a treehouse for 3 days while watching out for and listening to the rare black-crested gibbon, a member of the ape family. I am very passionate about the outdoors and nature and there are plenty of experiences throughout Asia to put you up close to some of the rarest and most beautiful wildlife on the planet. In this week’s episode of Far East Adventure Travel The Podcast a visit to Chitwan National Park in Nepal, in search of rhinos and tigers. Nepal is not just about the Himalaya, although you wouldn’t want to visit this former kingdom without at least a look at one of the most spectacular mountain ranges in the world. The country is also filled with other kinds of adventure activities and spiritual sites. One of the most unique wildlife experiences in the world can be found in Southern Nepal in Chitwan National Park-one of only a few wildlife parks in the world that allows walking safaris and a chance to get up close to one horned rhinos, sloth bears, and the royal bengal tiger. Chitwan can be reached by bus from the capital, Kathmandu, which is a pretty bump 5 hour ride. On my visit I could only get a seat on a local bus, I liked how they passed out puke bags. I was traveling during Dashain, the Hindu festival that takes place in the fall. You can also arrive by plane to Bharatpur where you will pick-up a taxi to your lodge around Sauraha. Flights can be booked daily from Kathmandu. Not that long ago there were several lodges that operated inside the park and offered some of the best wildlife viewing. Unfortunately due to environmental concerns the government of Nepal did not renew their leases and in 2012 the lodges were closed. So you’re only option now is to stay near or right outside the park. Many 2 night 3 day packages for a trip to Chitwan National Park can be arranged through a tour operator in Kathmandu and are certainly convenient in that all of your transportation and meals are usually included in these packages. They also quite often include an elephant ride into the park. If you’re looking for a more interesting approach into Chitwan and are willing to take on a more risk, then you can hire a licensed guide and do a walking safari. The packages normally don’t offer this option so you will have to book this ala carte. Most of the hotels in the area can arrange a guide for you and at the time of writing with your entrance fee works out to about $30 USD including the guide. There is also an office at the entrance to the park that offers licensed good quality guides. Now of course walking in the park as opposed to being transported on an elephant is going to definitely more risky. The wildlife in the park tends to keep it’s distance from elephants and their smell also masks the scent of humans. Don’t forget you are in the backyard of the some of the most dangerous wildlife on the planet. Tigers although deadly, aren’t actually the most threatening animal according to the guides. When I asked my guide Dev which animal he considered the most dangerous without hesitation he answered the rhinoceros. Just a couple years earlier Dev had been charged by a rhino and was laid up for almost 7 months recovering from his leg injury. He was escorting a couple of young German tourists in the park when they came upon a mother rhino and her baby. When he cautioned his clients to keep a minimum distance of 20 meters they didn’t listen to him, instead moving closer to get a shot with their small pocket camera. The mother immediately charged them all. Luckily no one died but the young tourists were also hospitalized. Sloth bears are also a concern, their behaviour is highly unpredictable. The best way to scare a sloth bear off I learned is to crowd together in your group and make loud noises. Leopards are also in the park but are usually found on the not often trekked perimeter. Safety is of utmost concern and the guides are trained to handle all situations. On my one day safari Dev brought an assistant that watched my back. Before we started our trek Dev and the assistant went over how to handle rhino charges, sloth bears and tigers. I felt like I was in good hands. I was in Kathmandu and Dasain the Hindu festival that celebrates the God Durga was winding down and the last of the goats had been sacrificed for another year. My friend Birendra had arranged for a bus ticket to Chitwan National Park, a local bus, which has more stops but definitely a higher level of cultural experience. There were about 6 Westerners on the bus, the rest, Nepalis heading back to their hometowns after celebrating Dashain in Kathmandu. Their tikas the ceremonial red dot on their foreheads were big, fresh, and made up of a mixture yoghurt, rice and vermilion. The bus ride was one of the bumpiest I’ve experienced on the subcontinent. 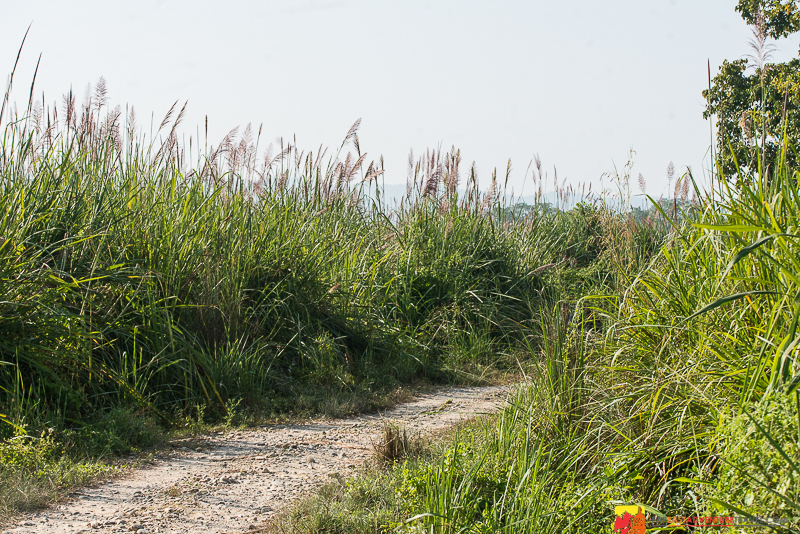 Up until the 1950’s the only way to get to the area now known as Chitwan National Park was by foot. This was the playground of sportsmen who hunted tiger, rhino, leopard and other trophies. Today Chitwan, all 932 square kilometres is protected land and has one of the biggest populations of Bengal Tigers on the subcontinent, one estimate reported over 80 breeding tigers in the park. I arrived at my hotel near the entrance to the park mid afternoon and the rest of the day was spent resting and making arrangements for a guide for a walk in Chitwan the next day. I was there in October which is not long after the monsoon when the grasses and vegetation are thick making wildlife spotting much more challenging. January through March are the best months for wildlife spotting as the local farmers cut down the giant grass. I met my guide Dev and his assistant the next morning and we set out for the park just after 9am. It was a short walk from the hotel which sits around the village of Sauraha on the edge of the park. A crossing of the Rapti River in a traditional dugout canoe which was less than 10 minutes was necessary in order to start the day long trek. Once we landed on the other side of the river it wasn’t long before Dev lead us into thick tall grass and my heart was already beating a little faster knowing now that I was right in the territory of tigers and rhinos. Dev stopped in front of us and paused for a moment. He was trying to listen to see if he could hear rhino moving around. Because the grass was so tall it made it more difficult to spot wildlife for viewing, and safety. My heart was racing even faster. No rhinos though. We would keep moving. Along the way through the grass we found a path through a patch of forest and started moving through looking for signs of tiger. On a couple trees Dev pointed out the scratch marks from tigers, a method of marking their territory.We came across a couple of the tiny barking deer but no signs of tigers or any other predators. After trekking through the forest and the adjacent trail along the river bank we headed for one of the observatory towers in the park to take a break and see if this perspective would allow for any sightings. When we got to the top of the tower Dev pulled off his shoes and showed me the blood dripping from his ankle that lead to a couple of leeches around his foot. When I looked down at my own left foot I was surprised to see blood and a leech that I quickly pulled off. They are usually found in the park especially at that time of year. While we rested Dev told me the story about a couple of clients he had who were so determined to see a tiger that they offered to double their fee if he was successful showing them one. They were actually on a multi-day trek of the park which allows for a much greater chance of spotting a tiger and with Dev’s knowledge of the area, he grew up in the park, he was confident he could pull off the challenge. They settled in a spot deep in the forest and waited patiently for two days before finally spotting a bengal tiger. Upon the sighting the women of the couple fainted and the man peed his pants. Money well spent I guess? After we moved on from the tower we walked around the park for another 1.5 hours. Near the tower we spotted our first tiger tracks. 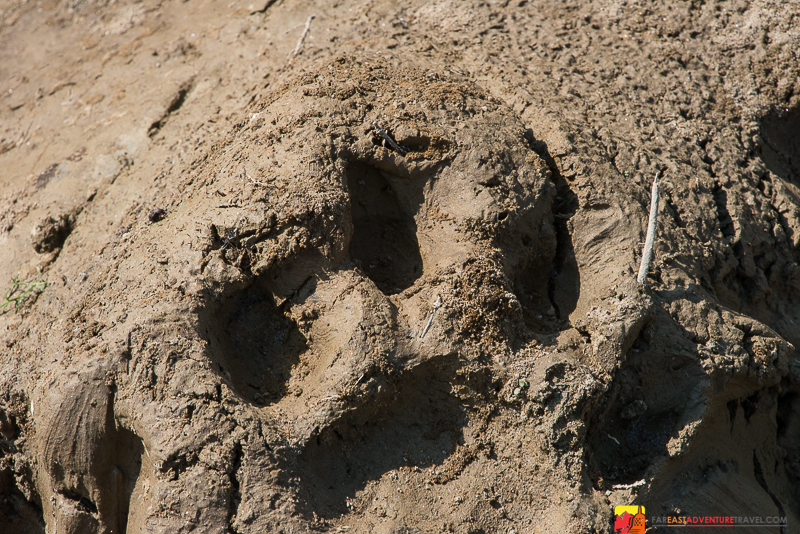 They were massive and Dev, tracing the marks showed me the length the tiger moved with just two steps, about 5 meters. Dev knew the tiger and had seen it in the area before. I saw the scratch marks from tigers earlier in the forest but the paw print or pug mark was the reality check. I was right in the path of one the greatest cats and predators on the planet. Right in their territory, their home. It could have been even watching us as we were inspecting it’s marks. Dev figured though the pug marks were a couple of days old. We moved on and now I had even a greater sense of appreciation of where I was and humbled by my surroundings. We were unsuccessful in spotting anything else other than a couple of mahouts out with their elephants. The heat was intense in the midday so we found a tree to sit under and eat our lunch. Dev continued to spot with his binoculars in one of the nearby trees and his assistant did the same in the opposite direction. I watched out from under the tree across the grasses, completely comfortable. Absolutely intoxicated by the feeling of being right in the heart of some of most exciting and dangerous natural surroundings I had ever been in. Completely vulnerable but not wanting to be anywhere else in that moment. It was the late afternoon so we had to move on and leave the park. No sightings but a much deeper respect for where I was and how fragile life can be here. I wasn’t the least bit disappointed. Walking through Chitwan Park with a deeper sense and respect for the wild and its inhabitants was a gift that equaled a wildlife spotting. Dev, the consummate guide offered to meet me back at the entrance to the park an hour before sunset. He assured me we would have a pretty good shot at seeing some rhino come down to the river. So I met Dev about an hour later and we walked down to the riverbank where a small group of people had gathered to watch the sunset and one last chance at spotting the one horned rhinoceros of the area. It was late and the sun had almost set when with the help of binoculars we could see a rhino a hundred meters or so from the riverbank. Soon after the sunset we spotted a mother and young rhino near the riverbank, they disappeared almost immediately after the sighting. It was a great way to end the day but honestly if I hadn’t seen the rhino I would have still been happy with my time in Chitwan. When Dev and I walked out of the park it was dark. We were about 5 minutes from the entrance when all of a sudden something rushed out of a tree and ran across the path directly in front of us. It was extremely fast, it was wild, and it shook the ground it raced across. I did not sense that it was a domestic animal like a dog, and it had a low deep growl as it ran. “A wild boar” Dev said, and maybe one last reminder of the respect that places like Chitwan National Park command and deserve. Once again a word of caution that a walking safari into Chitwan National Park is filled with risk and there have been many incidents of tourists being attacked by wildlife. You can see a short video of my day in Chitwan National Park when you visit breezy-size.flywheelsites.com. While you’re there, please connect and like Far East Adventure Travel on Facebook. You can also follow Far East Adventure Travel on Twitter and connect with me John Saboe on Google Plus. Listen to Far East Adventure Travel The Podcast on your regular commute, you can also view images as part of the podcast and don’t forget Far East Adventure Travel The Podcast is brought to you by Far East Adventure Travel Magazine, featuring amazing adventure ideas and experiences along with travel trips and advice for your next big adventure in Asia. Go to the iTunes App Store, search Far East Adventure Travel, download the app, and subscribe. Now with a 7 day free trial! That’s it for this week’s edition of Far East Adventure Travel The Podcast, thanks so much for listening. Until next time this is John Saboe, safe travels and Namaste.